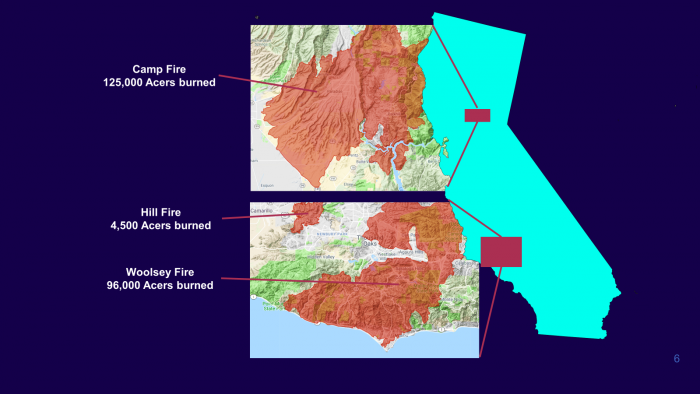 With multiple wildfires continuing to impact California, there have been a few significant updates. The Camp Fire in Butte County, has become the most deadly and destructive wildfire in California history. As of 11/14/2018, there are approximately 48 fatalities and 200 still missing. There have also been 7,000 structures destroyed, most residential homes with 15,000 still in danger. In Paradise, California, much of the community is destroyed and hospitals have begun evacuations. The Woolsey Fire is only 35% contained and has now destroyed 370 structures with another 57,000 in danger. There are also 2 confirmed fatalities. The Hill Fire is now 90% contained. The overall impact from the fires has now been estimated at 80 Billion dollars and are anticipated to rise, based upon the weather forecast. The weather is expected to remain dry into December which will mean continued difficulties in controlling these and any other potential fires. It could exceed $200 Billion in the period of a week. Officials are likely to take weeks to formulate a plan for residents to return to their homes since many areas are still too dangerous to enter. Many buildings lack essential services such as power, water, and gas. The over 8,000 crews will have significant work ahead of them to make the areas safe. Because of this and as we enter into the holiday season, additional issues of knowing whether a home is intact or not, whether a vehicle is destroyed, whether a business will re-open, when it will be safe to go back, difficulties of life in a shelter for evacuees, not knowing what may have happened to animals, looting, how long will it take to recover and the difficulties of the re-entry and re-evacuation process, will likely increase. R3 consultants have been providing response efforts since November 8, when the Camp Fire was first called in in Northern California. What has added complexity to response efforts, particularly with the Woosley Fire is the continual, rapid change in conditions have created safety concerns and inaccessibility for our consultants. We will continue to monitor the progress of the wildfires and to provide response support for as long as there is a need.